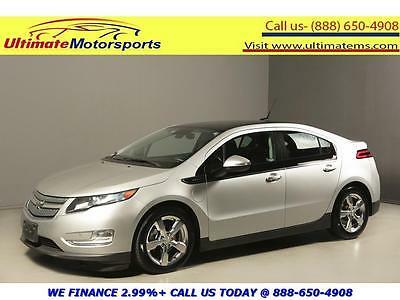 2014 Chevrolet Volt Base Hatchback 4-Door 2014 Chevrolet Volt Hybrid, 1-owner, extra clean! 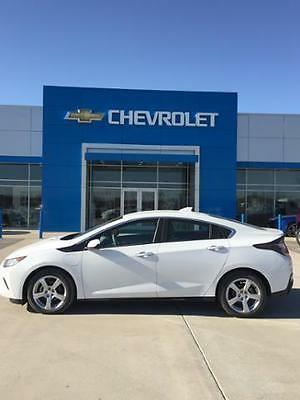 2017 White Diamond Metallic Chevy volt 7,500 miles and basically brand new!! This is an electric vehicle and I currently get 50-55 miles per charge. 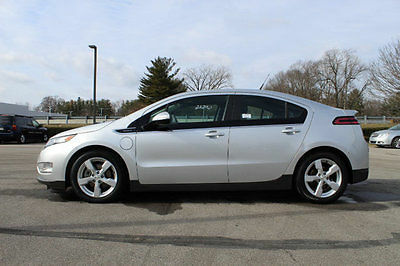 Car drives like a dream and has several modes including a sport mode that has awesome pick up and handling. 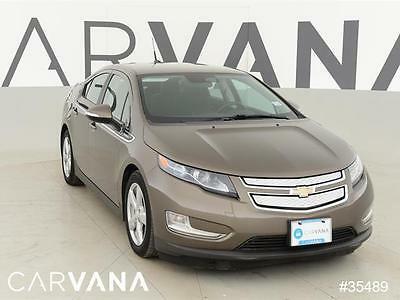 Heated leather seats, heated leather steering wheel, OnStar equipped, Wi-Fi ready, 8 inch touchscreen display with great backup camera. I currently get 96 miles per gallon car comes with standard 110-volt plug to charge it and cost approximately $20 to $25 per month on an electric bill which is far cheaper than gas. I only fill up every two to three months and the car has an 8 gallon tank so it costs about $16 to fill this car!! Truly is an ultimate money saver and extremely fun to drive! Look at the reviews for the 2017 Chevy Volt!!! 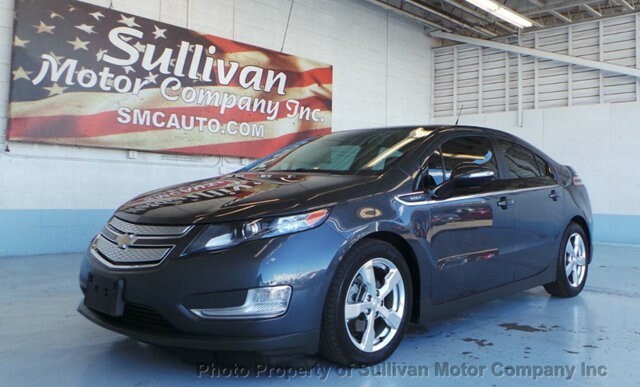 Car was originally $37,600 and it has only 7,500 miles you are getting almost $10,000 off a basically new car. Some customers may qualify for other rebates or discounts, if you have a GM Credit card you may have earnings that can be deducted on this vehicle. You may have also received a bonus earnings coupon from General Motors in the mail. Whatever the amount is that your coupon shows can probably also be deducted from this vehicle. Please contact us so that we may confirm your earnings. Putnam Chevrolet does not have any extra fees or documentation fees. The price you see is the price you pay. This is a 50 state legal car, so it can be sold in any state in the lower 48 states. Putnam Chevrolet has been in business in Moniteau County since 1923. We are a local, family-owned dealership. If you live within a state bordering Missouri, Putnam Chevrolet will send a driver to pick up after the deposit has been made if you need transportation to the dealership. Putnam Chevrolet will also pick you up at the following airports if you would like to fly in. "St. Louis O'Hare airport in St. Louis or the Kansas City airport. If you are flying in from Chicago or Dallas, we have a great airline that flies into the Columbia airport in Columbia Missouri and this airline has great rates. Putnam Chevrolet is a family owned business that opened in 1923. In 2000 Putnam Chevrolet began selling on EBay under the seller name of "oldvetteparts" and also "noschevyparts". We have recently added the "buyatputnams" seller name to help maintain the privacy of our customers. Our normal business hours are 8:00 a.m. to 6:00 p.m. Monday thru Friday and we are open Saturday from 8:00 a.m. to 3:00 p.m. but closed on Sundays. You may contact Ryan Struemph at 573-796-2131 or 573-694-6015 by phone or by text or you can also go through EBay. If I am with another customer I will contact you as soon as possible. If you have a General Motors credit card that has reward points on it or if you have a received a special offer in the mail, these discounts may also apply to the purchase of this vehicle. Please contact Bill Campbell at 573-353-3754 to find out which rebates are stackable, as not all rebates can be used together. As the Buyer you will be responsible for any title or registration fees that apply in your state. Putnam Chevrolet will supply notarized purchase documents with each transaction at no extra charge. We also lease and offer different rebates for leasing as well call for details. Scott Tubbs (814) 258-7127 505 E Main St Elkland Pennsylvania 16920-1212 ? ? ? ? 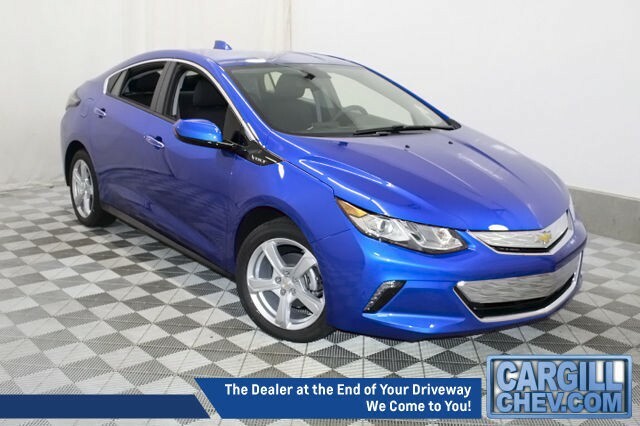 2017 Chevrolet Volt LT Vehicle Information VIN: 1G1RA6S50HU120796 Stock: 17NC011 Mileage: 2 Color: Kinetic Blue Metallic Body: Hatchback ? ? ? ? 1 of 35 ? View Large Images ? ? ? Apply Now Secure Credit Application Applying for a vehicle loan online is one of the quickest and easiest application methods. Our secure application is easy to complete, all you need are a few personal and employment details. 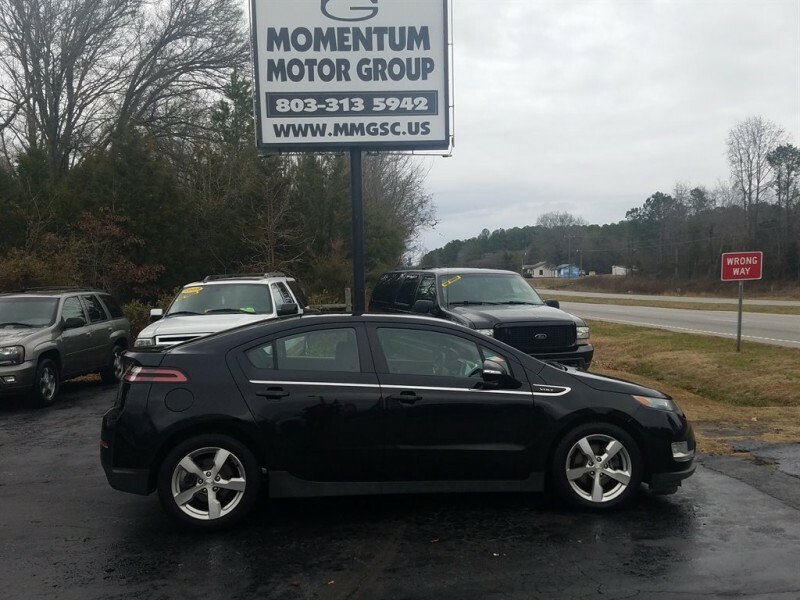 ?Credit Application ?Directions to Dealer ?Contact Us Description This is a 2017 Chevrolet Volt!! 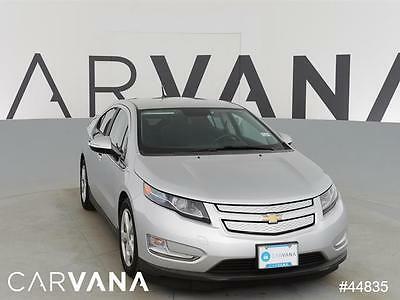 Chevy upped their game with this car over the last generation Volt in every way, the interior, the exterior and the new mileage ratings of up to 53 miles of pure electric driving and EPA fuel ratings when no electric left of 43 mpg city / 42 mpg hwy!! 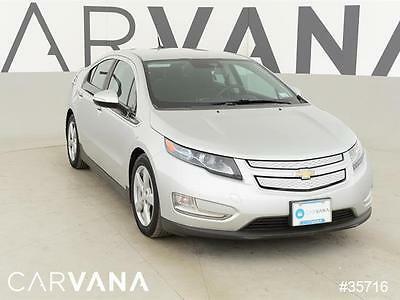 !We are pricing this Volt right. MSRP $34970 - Dealer Discount $2500 - $1500 Select Inventory Bonus TAG Rebate = eBay Sale Price of $30970!! 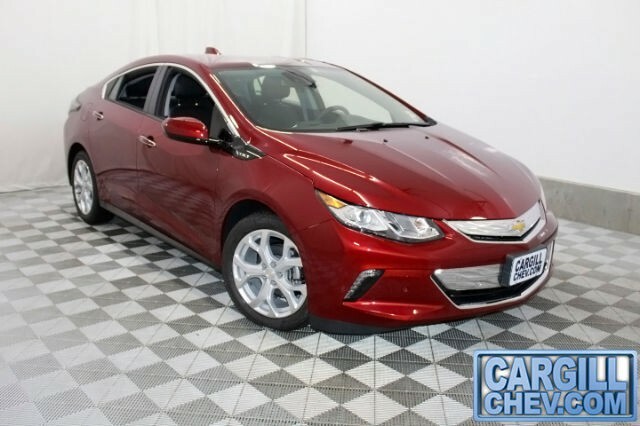 Great Lease program available on this 2017 Volt With just First Payment, local sales taxes, and registration fee's due at delivery the payments would only be 39 months/12000 miles a year is $296 a month!!! 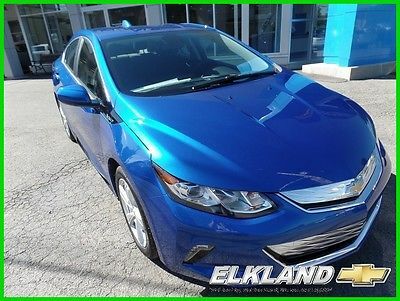 * with qualified approved credit thru GM Financial * Offer Expires 2/28/2017 Any questions please email or call Scott Tubbs Chargeable Options: MSRPGD1: Kinetic Blue Metallic$395.00PDB: Convenience Package$460.00VK3: Front License Plate Bracket$20.00 No Cost Options: L3A: Engine, range extender, 1.5L VVT, DI DOHC 4-CylinderNE1: Emissions: NE (AZ/CT/DE/MA/MD/ME/NJ/NY/OR/PA/RI/VT/WA) Other options: 2LT: Hatchback, LT5GP: Tire, All, 215/50R17 SL 91 H BW ALSD31: Interior Rearview Tilt MirrorDLW: Mirror, O/S, LH/RH, Remote, Elec, Manual Fold, HeatedFXJ: Ratio Transaxle Final Drive 2.64H1T: Jet Black, ClothIO5: Audio System, MyLink Radio, 8" color touch screenJ67: Brakes, Front/Rear Disc, ABS 15"KA1: Heated Seats, FrontKTI: Tire Inflator KitMKV: Electric drive, extended rangeRSB: Wheel, 17x7.0, Aluminum, 5 Spoke, PaintedUHS: Driver Information Center, 8-inch color displayUVD: Heater Steering WheelVV4: Onstar 4G LTE Wi-Fi Hotspot capabilityVY7: Knob, Shift, Leather-wrapped Why are we selling this 2017 Volt so reasonable? 1. We are a small rural Chevrolet dealership located in north central PA, lower overhead = lower prices. 2. We are serious about our eBay motors business. 3. We want your business and positive feedback. If I can answer any questions, please feel free to contact me. We answer our emails on the weekends, too!!! DELIVERY OPTIONS ******FREE DELIVERY WITH IN A 5 HOUR RADIUS OF THE DEALERSHIP****** We will also meet eBay customers at the following airports at no charge: Rochester, NY / Buffalo, NY / Syracuse, NY / Cleveland, OH / Pittsburgh, PA / Philadelphia, PA / Baltimore, MD. We appreciate our eBay business and will do all we can to make your delivery as convenient as possible. 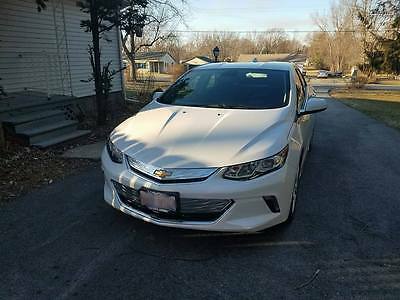 Contact Elkland Chevrolet 505 E Main St Elkland Pennsylvania 16920-1212 View Map Ask for:Scott Tubbs Contact: ?Contact Us Direct:(814) 258-7127 Hours Mon-Thurs:08:00 AM-07:00 PM EST Friday:08:00 AM-06:00 PM EST Saturday:08:00 AM-02:00 PM EST Sunday:Closed About Us Welcome to Elkland Chevrolet!! We are a small Chevrolet dealership located in North Central Pennsylvania, about a mile from the New York state line. We have sold vehicles from Maine to Washington state, from California to the Virgin Islands, with 100% positive feedback from our buyers!! We appreciate all of our internet business, and will do anything to make it a pleasant transaction. Our feedback is our future. Check it out. We price our vehicles to sell, lower overhead = lower prices. Options and Standard Features Options ? Outside Heated Power-Adjustable Body-Color Mirrors ? 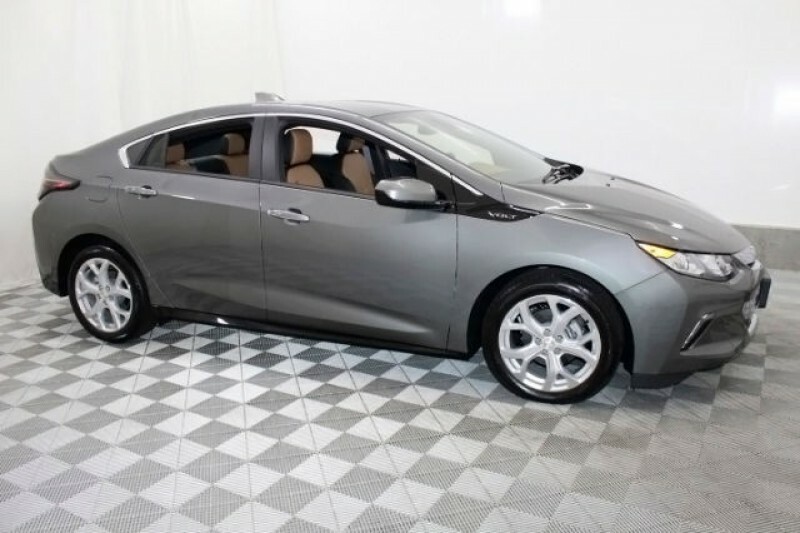 Heated Driver & Passenger Front Seats Basic Information Stock Number: 17NC011 VIN Number: 1G1RA6S50HU120796 Style Name: Hatchback LT Make: Chevrolet Model: Volt Model Year: 2017 Vehicle Type: Hatchback Vehicle Trim: LT Interior Color: Jet Black/Jet Black Exterior Color: Kinetic Blue Metallic Body Type: Hatchback Engine Engine Description: 1.5L I4 16V Fuel Type: Hybrid Fuel Induction: Gasoline Direct Injection Valves Per Cylinder: 4 Aspiration: Normal DriveTrain Driven Wheels: Front-Wheel Transmission: 1-Speed Automatic Wheels Rims: Painted Aluminum Drive Train Type: FWD Suspension Independent Suspension: Front Stabilizer Bar: Front Instrumentation Clock Compass External Temp Low Fuel Level Trip Computer Roof and Glass Front Wipers: Variable Intermittent Privacy Glass: Light Rear Defogger In Car Entertainment Antenna Type: Integrated Roof Audio System: Siriusxm AM/FM/Satellite Premium Brand: Chevrolet Mylink Speakers: 6 Seats Drivers Height: Manual Passenger Height: Manual Seating Capacity: 5 Front Seat Type: Bucket Upholstery: Premium Cloth Center Armrest Folding: Fold Forward Seatback Convenience Center Console: Full With Covered Storage Cruise Control Cupholders: Front And Rear Door Pockets: Driver, Passenger And Rear Overhead Console: Mini Power Outlets: 2 Seatback Storage: 2 Steering Adjustment: Tilt And Telescopic Steering Power: Speed-Proportional Electric Power Steering Power Mirrors: Power Remote Power Door Locks Windows: Power Windows Satellite Communication: Onstar Guidance Comfort Air Conditioning: Automatic Air Filtration: Interior Air Filtration Trunk Lights: Cargo Area Light Center Console Trim: Chrome Dash Trim: Chrome Mats: Carpet Front And Rear Reading Lights: Front And Rear Shift Knob: Leather/Chrome Steering Wheel Trim: Leather/Metal-Look Vanity Mirrors: Dual Vanity Mirrors Features Bumpers: Body-Colored Door Reinforcement: Side-Impact Door Beam Safety Turning Circle: 36.4 ABS: 4-Wheel Head Airbags: Curtain 1St And 2Nd Row Anti Theft System Brake Assist: Braking Assist Safety Locks: Manual Daytime Running Light Engine Immobilizer Headlights Auto Delay: Auto Delay Off Headlights Dusksensor: Dusk Sensing Front Headrests: Manual Adjustable Rear Headrests: 2 Rear Center Seatbelt: 3-Point Belt Safety Signal Mirrors: Turn Signal In Mirrors Safety Stability Control Driver And Passenger Airbag Side Airbag Stability Control Door Reinforcement: Side-Impact Door Beam Towing and Hauling Tie Downs: Cargo Tie Downs Doors Rear Door Type: Liftgate Side Door Type: Conventional Dimensions Front Head Room: 37.8 Inches Front Hip Room: 53.7 Inches Front Shoulder Room: 56.5 Inches Front Leg Room: 42.1 Inches Rear Head Room: 35.8 Inches Rear Hip Room: 51.3 Inches Rear Leg Room: 34.7 Inches Rear Shoulder Room: 53.2 Inches Luggage Capacity: 11 Cu.Ft. Length: 180.4 Inches Width: 71.2 Inches Height: 56.4 Inches Wheelbase: 106.1 Inches Curb Weight: 3,519 Lbs. Terms Placing a Bid: Your bid constitutes a legally binding contract to purchase this vehicle. Please do not bid if you're not seriously interested or financially able to purchase this vehicle. 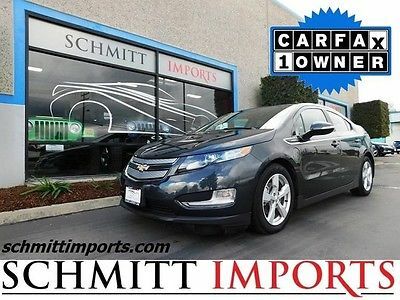 Please read eBay's User Agreement Walters Elkland Chevrolet, Inc reserves the right to, Obtain and verify the registered information of all users who bid on this auction. Cancel any and all bids at our discretion, or end the auction early if necessary. Bidders Age: You must be 18 years of age or older to Bid. Special eBay Bid Retraction Rules: Please read eBay's "Retracting a Bid" If you place a bid before the last 12-hour period of the auction: You may retract that bid before that last 12-hour period but only for exceptional circumstances. You will not be allowed to retract that bid during the last 12-hour period of the auction. If you place a bid during the last 12-hour period of the auction: You will be allowed to retract the bid for exceptional circumstances but only if you do so within one hour after placing the bid. Funds & Financing: For help in arranging for a Pre-Approved loan or for any questions please e-mail or phone Sales Department at 814-258-7127 prior to bidding. Buyers Inspection: Walters Elkland Chevrolet, Inc has done our best to disclose all information known about this vehicle for auction. Walters Elkland Chevrolet, Inc welcomes a buyers inspection. If you plan to have a buyers inspection, please make sure you inspect the vehicle prior to the auction ending. Inspection fees if any are Buyers responsibility. Representations and Warranties made by seller: This vehicle is being sold "as is". Manufacturers warranties may still apply. Extended warranty may be available, e-mail or phone Sales Department at 814-258-7127 for details. No representations or warranties are made by seller, nor are any representations or warranties relied upon by bidders in making bids. Taxes and Registration fees: Out of state buyers are responsible for all state, county, city taxes and fees, as well as title service fees in the state that the vehicle will be registered. All taxes and fees must be paid in full in order for vehicle to be titled and registered. Title Information: Vehicles titles may be held by banks or lenders as collateral for loans. In many cases there is a delay in receiving the original instruments up to 21 days from the time we pay a vehicle off. While we usually have all titles in our possession at closing, there are occasions where we may be waiting for them to arrive. If payment is made by cashier's or personal checks we will hold all titles for 10 days or until funds have cleared. Shipping & Delivery: All shipping charges are buyer's responsibility. Walters Elkland Chevrolet, Inc will help with shipping arrangements but will not be responsible in any way for claims arising from shipping damage! Licensed Carriers are generally insured for $3,000,000.00. We assume no responsibility for damages incurred after the vehicle leaves our showroom. 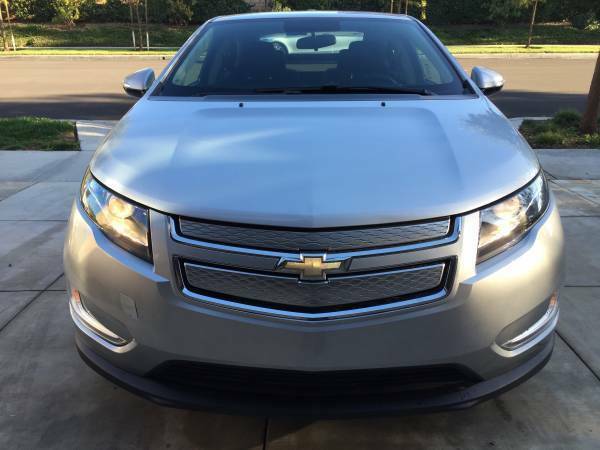 All shipping arrangements are provided by Walters Elkland Chevrolet, Inc as a courtesy. We are not affiliated with any carrier. Any claims or other communication regarding shipment of vehicles will be between you and the shipper, not with Walters Elkland Chevrolet, Inc. The amount of time it takes for delivery is dependent on the carrier, but is generally 7-14 days from the date the vehicle is picked up from our facility until it is delivered to your destination. Verify with the shipper for an Estimate Time of Arrival to be sure. Finalizing your Purchase: Walters Elkland Chevrolet, Inc will contact the successful high bidder by e-mail after the auction closes. Successful high bidder MUST communicate with Sales Department at Walters Elkland Chevrolet, Inc by e-mail or phone 814-258-7127 within 24 hours of the auction ending to make arrangements to complete their transaction. If we cannot confirm your intention to buy or the sale is not completed within 5 days, we reserve the right to relist this vehicle or sell to any other qualified buyer. In order to secure bid on vehicle, Successful bidder (BUYER) must within 24 hours of bid closing send to Seller a Deposit in the amount of 10% by major credit card, cash in person or bank certified funds. Within 72 hours of bid closing, Buyer must send balance of funds by cash in person or bank certified funds to Seller. At time of sending initial deposit, Buyer MUST fax copy of their State issued valid Driver License. Furthermore, before said vehicle is released for shipment to Buyer, all other Sale related and title related paperwork must be signed and returned complete to Seller. Copyright © 2017 Auction123 - All rights reserved. - Disclaimer +- Auction123 (a service and listing/software company) and the Seller has done his/her best to disclose the equipment/condition of this vehicle/purchase. However, Auction123 disclaims any warranty as to the accuracy or to the working condition of the vehicle/equipment listed. The purchaser or prospective purchaser should verify with the Seller the accuracy of all the information listed within this ad. Selling a Vehicle? Create Professional Listings Fast and Easy. Click Here!